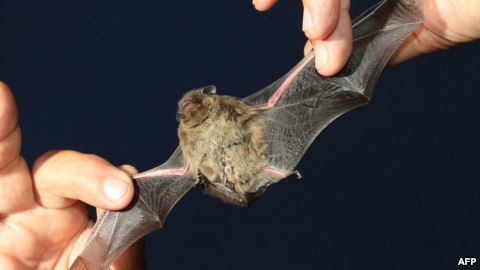 VOA Special English - Do Bats Hold the Secret to Long Life? Do Bats Hold the Secret to Long Life? Bats are the only mammals that can fly a great distance, but they have another ability. Many bats live a very long time for an animal their size. European researchers are studying bats to understand why they live so long. They hope to make discoveries aimed at fighting the aging process in human beings. Last week, the group of scientists said they had identified important biological qualities in some bat species. The group studied bat chromosomes, a line of genes found in the nucleus of cells. The scientists were most interested in structures connected to the ends of the chromosomes. They are called telomeres. Telomeres protect the ends of chromosomes, which shorten each time a cell divides. Scientists believe this shortening process causes cells to break down. They say this is what causes aging. A report on bats was published this month in the journal Science Advances. Among the leaders of the study was Emma Teeling, a biologist with University College Dublin in Ireland. The European researchers studied 493 bats from four bat species. The group used information that had been gathered over more than 60 years. Of these animals, the greater mouse-eared bat generally lived the longest, an average of 37 years. The scientists said this and a related species, which are grouped together under the name Myotis, had telomeres that did not shorten with age. Another Myotis bat holds the record for oldest age, reaching 41 years. The scientists’ findings suggest that these bats’ cells have the ability to maintain and repair their telomeres. This, they said, helps guard against the aging process. Based on its body size, a bat like the greater mouse-eared bat would be expected to live four years. But, these mammals have been found to live nearly 10 times longer than that. The scientists found that only 19 species of mammals live longer than humans when their body size is considered. Eighteen of these are bats. The only exception is an unusual African rodent, the naked mole rat. The Reuters news agency reported this story. Mario Ritter adapted the report for VOA Learning English with additional materials from the study. George Grow was the editor.